I am about to give to you one of the most SILLY statements I've ever heard someone say about natural hair, and I've heard it from so many people [That are NOT natural]. ...Here it Goes and I quote! NATURAL HAIR IS NOT A STYLE! IT'S YOUR TEXTURE! What the heck do you mean it is not for everyone! God gave it to you...RIGHT?! I can understand if someone says, "Not everyone know how to treat their Natural hair, so they should do something else." But saying that it's not for them is just Plain Stupid. I think Natural hair is for everyone, because God gave us curly hair not straight hair. As usual, we change what God intended for us, but Don't allow anyone to tell you that Your hair, Your Good hair is not for you! Be true to yourself...I'll rather hear someone say, I like wearing my hair straight. 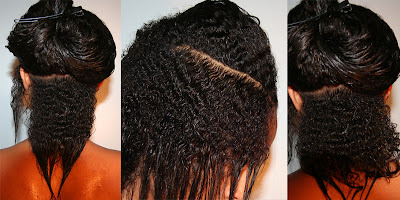 I like putting perms on my hair, but please do not say, "Natural Hair isn't for Everyone!" You discourage women / men with this talk. Just because you're not confident and don't believe that the hair God gave you will make you look good doesn't mean everyone should feel that way. I'll admit, I look good in any hairstyle! I choose my Natural Hair.